On my way to see Bill Viola’s video installation at St. Paul’s I didn’t know what to expect. I knew the work, Martyrs, was displayed on four vertical plasma displays on the South Quire Aisle and I knew that each screen contained a figure being subjected to the elemental forces of earth, wind, fire and water. I was hoping for was an echo of Viola’s stunning projection The Messenger, made for Durham Cathedral, in which he pulled off a transcendent piece of art shot-through with pulsating, gurgling colour; an incredible and disturbing soundtrack; and at four metres high an artwork on the grand scale. I was worried that it might resemble The Passions in which he recreated scenes from the bible using actors and shown on LCD screens lying on their sides. What I found was fresh and didn’t actually look like either of these. Approaching this work you see the installation positioned on the side of the high altar at the end of the quire. The structure in which the screens sit, designed by Sir Norman Foster, fits the space perfectly, measuring 140 x 338 x 10 cms, neither huge nor mundane. On the left hand screen there is a man covered in a pile of earth holding his head. Slowly the earth flies upwards and the man stands, ultimately alone, looking upwards. The second screen is the only woman, who is bound hand and foot and held, dimly hanging from above. Wind blows her from side to side, painfully twisting her around. Eventually her ordeal ends and she hangs, now still but looking upwards. In the third screen sits a man in a darkened space. Very slowly little tongues of fire fall around him, culminating in a conflagration that engulfs him. The flames stop and he rests, looking upwards. The final screen on the right shows a man lying on his side and bound at the ankles, his eyes shut. He is pulled upright, upside down. He hangs with his arms raised in the horizontal, with water falling heavily onto his feet and down his body. The water lessens and he is drawn upwards, his arms back at his sides, and out of vision. Many thoughts were sparked by looking at this and many religious parallels could be made. Many questions about man’s endurance, persistence and steadfastness also came to my mind. I repeatedly wondered at the pain the woman must have felt, hanging there, and I wondered, was it deliberate that Viola give the woman the heaviest burden? 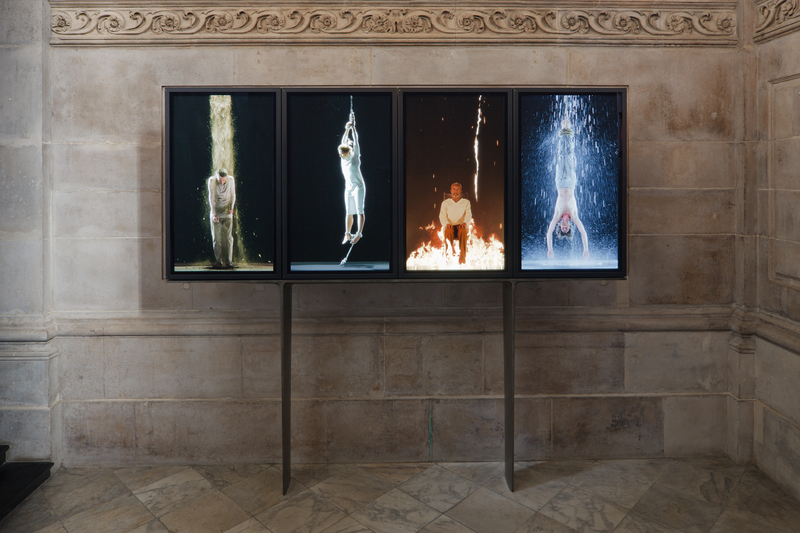 Bill Viola uses technology but his sources of inspiration are the Western and Eastern mystics. And many of Viola’s titlesimply areligious content. It seems to me that Viola is asking fundamental questions that traditionally we look to religion for the answers. By asking those questions it doesn’t automatically make the work religious. If that echoes the way we pray and meditate that merely reflects man’s insecurities not religious faith. I thought the work might take on something of a moving stained glass window but this work is not concerned with colour, then I realised there are no stained glass windows in St. Pauls – too Popish I suppose – and maybe he was respecting this. He also eschews sound, sadly but understandably, especially as, when I was there, a simple sequence was being played quietly by an organ somewhere. Like most of his work, Martyrs is shown in slow-motion (the second screen may have been in real time, it’s not exactly clear) a device that has been criticised for being inappropriate, ponderous and achingly obvious, but isn’t the point of slowing things down more to do with exposing the true elegance and wonder of the world around us, of giving us time to think? Viola’s work The Passions has been called vulgar, smug and tear-jerking hocus-pocus but I can honestly say Martyrs struck me as understated and dignified. I can see that some of his comments can be seen as self-satisfied but this work is anything but vulgar or smug. Bill Viola and his technology have come of age. This work shows an artist at his peak, assured of his tools but restrained and considered.